Precision Glass & Optics (PG&O), global experts in optical manufacturing and precision thin film coatings, has designed and developed custom optical filters for PRP Optoelectronics, the largest independent manufacturer of LED-based display technology. Click here to request more information from Precision Glass & Optics - PG&O on their custom optical filters for displays. Click here to visit PG&O’s website for more information on their precision thin film coating capabilities. The specialized thin film filters designed by PG&O are integrated into PRP Optoelectronics' avionics displays to modify the viewing angle and eliminate unwanted stray light that would otherwise distract the pilot(s) and cockpit crew. The new optical coatings' operational wavelengths and angle requirements are customized for sensitivity to nighttime lighting. 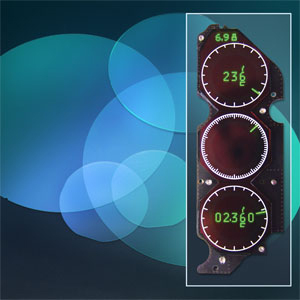 The precision thin film filters make it easier for the pilot to read the altimeter, the air speed indicator display, etc., in all lighting conditions, even at night. This advanced technology resolves what has formerly been a very serious challenge in military and commercial cockpit display/lighting ergonomics. Precision Glass & Optics provides high performance optical components and thin film coatings for the most demanding tasks. The company also houses an extensive glass inventory and can provide quick turnaround on a large variety of glass and thin film coated optical materials, from square, rectangular, and/or circular parts, to complex shapes and all types of precision optical prisms. In addition to optical coatings, the in-house facility has state-of-the-art glass fabrication equipment, including grinding, polishing, machining, scribing, engraving, CNC, and assembly. These can either be customized to exact specifications or shipped from in-stock items, within a 48-hour turn around, for time-critical projects. Industries served include military/defense, biomedical, life sciences, industrial, solar, imaging, aerospace, scanning, digital cinema, astronomy, laser manufacturing industries, and more.